Below is a re-post from Jon Argaman originally published on Jadaliyya. Jon Argaman is a PhD Candidate in political science at the University of Pennsylania. He researches the ways in which city building and questions of urban form emerge as sites of contestation over citizenship and identity. His dissertation research focuses on large planning and building projects in Cairo, Egypt, prior to the 2011 uprising. 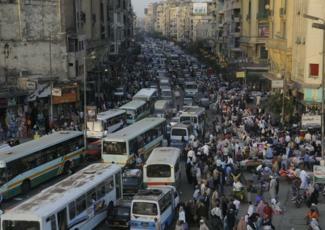 Cairo is a crowded city. It is a truism that is easy to find in reportage about the city, which almost invariably begins with a description of Cairo as teeming, noisy, dusty, and polluted. Vendors and parked cars take over sidewalks for lack of space, while pedestrians walk amongst traffic. Shouts and car horns drown out everything else and traffic jams stretch on for miles. Numbers back up the impression: In 2006, just as the a long-term “visioning” exercise known as Cairo 2050 was beginning, the World Bank estimated Cairo’s population density at 37,136 per square kilometer, while CAPMAS, Egypt’s national statistics agency, more recently (2012) had the number at 45,000 per square kilometer, or about one-and-a-half times the population density of Manhattan. The 2008 JICA (Japan International Cooperation Agency) master plan claimed that, depending on how one defines “Greater Cairo,” it may be the most densely-populated city in the world. It would seem obvious that this level of density is a problem, and that, as Minister of Housing Ahmed al-Maghrabi said a few months before the 2011 uprising began, the city will eventually explode. However, the seemingly-commonsense notion that Cairo must be un-crowded if it is to be sustainable, is problematic in two senses: first, there are reasons to be skeptical of claims that Cairo’s degree of population density actually is unsustainable and undesirable; and second, the assumption that Cairo is “too crowded” and therefore its people must be dispersed, allows state officials to disengage from the problems and concerns of the city and the people who live in it. Instead, the discourse around density contributes to and in a sense authorizes often-fantastical plans to colonize the desert. Historically, the question of population density in cities has been Janus-faced: on the one hand, density along with large population size is the commonsense notion of what makes a city a city. It is credited with fostering economies of scale, the exchange of goods and ideas, and cultural dynamism. On the other hand, a dense population was associated with chaos, crowding, dirt, and disease. That duality can still be found in recent discussions of the benefits and problems of urban density. In recent years, researchers have begun to uncover and explore some benefits of a densely-built and inhabited city for facing modern challenges: given basic levels of sanitation and public health infrastructure, denser cities are more productive and, notably, more environmentally-friendly. However, precisely because basic health and sanitation infrastructure are sub-par in some of the world’s densest cities, density does not correlate especially well with measures of livability. In that sense, Cairo faces very similar concerns as a number of other large cities in the so-called developing world: the question of how to accommodate a large and growing number of people with limited space and resources, and in the face of a changing climate, is a common one, especially in the discourse surrounding “megacities.” One could find similar questions about “sustainable” levels of density, asked in very similar ways, about Dhaka, Lagos, Jakarta, or Delhi. What makes Cairo notable, if not unique, is the large scale and scope of official efforts to reduce its density. A great deal of research has been done on the impact of neoliberal policies and discourses on Greater Cairo: social and spatial polarization, the rise of gated communities and luxury consumer lifestyles, and the marginalization of a large underclass that had neither the financial nor social capital to “buy in.” It is in that context that the Egyptian state has aggressively promoted channeling Cairo’s “chaos” into new desert communities. Its most recent project, a “visioning” exercise known as Cairo 2050, contained a number of seemingly-fantastical proposals for de-densifying the city, including completely removing whole neighborhoods, replacing them with parks, and resettling their residents in planned communities in the desert. This essay, which is based on my field research on the politics of large building and planning projects in Cairo between August of 2010 and July 2012, examines the internal logic and problematic impact of those efforts. Planning exercises for Cairo from the last few decades, up to and including the 2050 vision, are preoccupied with density. They are preoccupied with reducing the extremely high population density of Cairo and the Nile Valley, and they are preoccupied with increasing the low population density of the rest of Egypt’s geographical area. The former is seen as an untenable situation and a ticking time bomb, the latter as a waste of perfectly good land. Cairo’s desert New Towns appear for the first time in the 1970 master plan, as a reaction to what the plan characterized as a fast-growing surplus of inhabitants due to rural-urban migration, and a lack of infrastructure, particularly sewage and roads, to serve that population. By the end of that decade, plans had been drafted calling for fourteen new urban centers to be built throughout the country, nearly all in the desert. Rural-urban migration leveled off in the ensuing decades, but Cairo has continued to grow rapidly, and channeling that growth into the desert has been a core element of official plans for the city, and the country, up to the present day. The conquest of the desert is no longer a slogan or dream but a necessity dictated by spiraling population growth. What is required is not a token exodus into the desert but a complete reconsideration of the distribution of population throughout the country. These claims of necessity seem reasonable on the face of them. Many of the issues of concern that appear in planning documents (traffic, green space, housing capacity, pollution, health, and informality) are density-related. However, population density itself—the sheer number of people and the concentration of them—comes to be characterized as the root problem that needs solving, rather than poor transit infrastructure, poor health and education infrastructure, or housing access. This is not to say that plans for Egypt in general and Greater Cairo in specific do not call for improvements in housing capacity, access to medical care, number of schools and schoolteachers, etc. All six of Egypt’s five-year plans, as well as Cairo’s strategic plans, dutifully include these points. Rather, they come attached to a framework of rarefaction (i.e. de-densification)—the channeling of virtually all new growth out of the city, and, in the 2050 plan, large-scale removal of citizens already living in Greater Cairo. This push for less density reflects an optimistic view of Egypt’s capacity to spread services over a wide area. There are good reasons to be skeptical of this optimism: Both the World Bank and the GOPP’s own research indicate that Cairo’s population density is actually a mitigating factor in some of the city’s most persistent problems. The road network has a low capacity relative to the volume it has to handle, and public transit options are unequal to the difficult task before them, but high density means that trips will be, in the aggregate, shorter in distance and resource cost than they otherwise might be. Planner David Sims notes that over seventy-five percent of Greater Cairo’s population lives within fifteen kilometers of the city center, and according to a 2000 study, thirty-six percent of all journeys within the Greater Cairo Region were on foot. This relatively high rate of walking, which relieves some of the burden on overtaxed road and transit infrastructure, would not be possible without high densities. Sims also notes that these densities “allow for the very high ridership of public transport systems that guarantees their frequent service and economic viability,” and that a dense, compact city tends to produce jobs and services that people need, in relatively close proximity to where they live. If the government finds itself struggling to provide services to a population that is still compactly-distributed, it is difficult to imagine providing those same services to a widely-dispersed one, particularly for lower-income residents who would be reliant on public transit in a lower-density setting. And yet, along with the wealthy who seek space and escape from urban problems, it is precisely the very poor who are being targeted for dispersal to lower-density desert suburbs. If the public transit network is currently insufficient for a relatively compact megacity, how will it handle the vastly more complex task of linking up a sprawled one? A City on the Verge of Explosion? That Cairo is unsustainably crowded was a sentiment I encountered many times in the course of field research. It was expressed as an obvious truth, in no need of justification or explanation. Similarly, in every master planning document I have been able to find, “reducing population concentration,” to use the turn of phrase from the sixth (2007-2012) five-year plan, has been asserted as a self-evident good. In interviews, common metaphors used for the city were a dam about to burst (from English interviews), or a bomb (qombela) that is going to explode (tinfeger). The rhetoric of crisis is telling. Considering that it is possible to find statements warning of Cairo’s imminent collapse, in very similar language, from virtually every year since at least the late seventies when Cairo’s population was a fraction of what it is now, such talk implies the possibility of a myth. By myth, I mean not an outright falsehood, but a story about the world repeated again and again until it takes on the character of obvious truth. No doubt a large and growing capital will put further strain on Egypt’s water, food, financial, spatial, and infrastructural resources. But what does it mean for a city to collapse? What does it mean for a city to become impossible? Indeed, with each of the specific ills said to be caused by Cairo’s large and densely distributed population, the iron link between density and the problem turns out to be untrue, or at least not quite true. Traffic gridlock is bad, but comparable to and in fact slightly better than what would be found in such “emerging global cities” as Bangkok or Mexico City, and in any case density seems to be a mitigating rather than an exacerbating factor (see for instance this World Bank report). It is likewise true that Cairo lacks green space, with roughly 1.65 square meters per capita instead of the WHO’s suggested minimum standard of nine square meters, or the “best practice” standard of twenty square meters commonly used in wealthier countries. However, massive rarefaction is a disproportionately invasive option, if the goal is simply to build more parks. Likewise with schools and medical care: some of Cairo’s densest areas lack enough of both, but if anything, each new school or clinic provides relatively more coverage in a dense area than a sparse one. So why have all plans since the seventies insisted on addressing these problems within a framework of density reduction? One piece of the puzzle is that some of Cairo’s most densely populated areas are informal and often illegally built neighborhoods, known in Arabic as ‘ashwa’iyyat. Or more precisely, those areas whose densities and crowding are identified as “problems,” such as Ezbet al Haggana or parts of Imbaba, tend to be ‘ashwa’iyyat(highly crowded but higher-status areas, such as Mohandiseen, are not typically characterized as unsustainable in the same way.) The high population densities they tend to have—along with disorder, ugliness, encroachment on scarce farmland, and other criticisms of these areas—are frequently described in official documents and in my interviews as the result of “a lack of planning.” Whether intentional or not, the density-reduction framework allows officials to prioritize large planning and building projects over providing the services that might make existing, but stigmatized, neighborhoods more livable. In this sense, the myth that Cairo is on the verge of detonation is a productive one. If Cairo is too crowded due to lack of planning and the rise of ‘ashwa’iyyat, then, the reasoning goes, planners must come up with a way to un-crowd it. If the root of Cairo’s urban woes is that the city is unsustainably dense, then merely providing services and infrastructure to existing areas is insufficient. In other words, the myth provides justification for the imperative to start over, to avoid dealing with the existing city, which requires a fine-grained understanding of communities and their needs, and instead turn to dreams of building new housing and cities elsewhere. As one Cairo Governorate planner said in a personal interview, granted on condition of anonymity, “It is as if, every few decades, we declare Cairo’s problems to be impossible, unsolvable, and that the only solution is to start fresh just outside the existing built-up area.” Here, the appeal of the desert becomes evident: it is, or at least seems, empty and infinitely malleable, the perfect canvas for land-moving, water-pumping, solar technology, and other symbols of technological might that states and engineers are fond of deploying. Building in the desert at least seems like a technical problem rather than a difficult and fine-grained social problem, although getting people—particularly the poorer residents of some of the densest informal areas that are seen as contributing the most to Cairo’s crowding—to move to the desert is another story. If society cannot be controlled, the reasoning goes, perhaps nature can. This, ultimately, is the political work that emphasis on the “crisis” and “unsustainability” of Cairo’s density does: it enables state actors to disengage with the problems and social inequalities of the city where people live, and instead imagine those people living somewhere else. Such a focus reproduces and exacerbates social inequities: it authorizes a particular kind of solution to Cairo’s problems. Rather than expanding services that can make high-density work, the state promotes sprawl. The well off (voluntarily) decamp from the city and move to new developments that are walled-off, sometimes literally, from the rest of the populace, while some of the city’s poorest are targeted for (often-involuntary, and poorly-compensated) removal to new planned communities. The impact is even clearer in the context of official plans to transform and settle desert land outside of the Nile valley. Channeling a large fraction of Egypt’s population into the desert over a series of decades is a massive undertaking, and one that has been criticized, feasibility concerns aside, on grounds that it is an attempt to wish away Egypt’s current social reality, and to avoid addressing serious and growing inequality and polarization. Over the course of my research, I heard activists, NGO professionals, housing advocates, academics, and others express many variations on the criticism: “Why is the government pursuing fantasies in the desert when there are so many issues in the already-existing city that need to be addressed?” Density, or more precisely the way in which the discourse about Cairo’s density has been employed, is a key element of the logics of those plans and priorities. Thinking in terms of density—and how to identify and meet priorities for improving the livability of a dense city—provides both a better understanding of official policy and growth strategies, and a crucial part of thinking through alternatives. See for instance Jane Jacobs, Cities and the Wealth of Nations (New York: Vintage, 1985). See particularly “Dreamland” in Tim Mitchell, Rule of Experts: Egypt, Techno-politics, Modernity (Berkeley: University of California Press, 2002); Eric Denis, “Cairo as Neoliberal Capital: From Walled City to Gated Communities”, and Mona Abaza “Egyptianizing the American Dream: Nasr City’s Shopping Malls, Public Order, and the Privatized Military” in Singerman and Amar eds., Cairo Cosmopolitan: Politics, Culture and Urban Space in the New Globalized Middle East (Cairo: AUC Press, 2006). See David Sims, Understanding Cairo: The Logic of a City Out of Control (Cairo: AUC Press, 2011: Chapter 3.) For discussion of plans and decentralization up to the early 1990s, see UN-HABITAT, Metropolitan Planning and Management in the Developing World: Spatial Decentralization Policy in Bombay and Cairo(1993). “Tackling the Shelter Challenge of Cities: Thinking it Through Together,” GOPP Presentation at the World Bank, Cairo, April 30, 2007. Ibid. Also see UNDP “Greater Cairo” Project Document # 00056471.